My last two blogs have been about how I managed to convert XAML icon shapes into native Visio masters. Well, I have now converted all of Syncfusion’s Metro Studio 2 shapes, and got their permission to release my own version of them. See http://www.bvisual.net/Products/MetroIcons.aspx for more information. I decided that one good use for these icon shapes is on a tile shape to make Windows 8 style diagrams. I made this shape as simply as possible, but I wanted to be able to glue them together to make a regular grid. 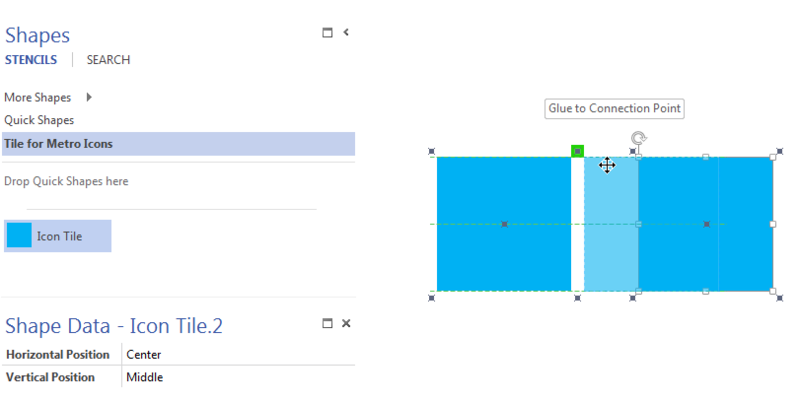 I put connection points of type 1 and 2 at each corner, offset by a page Shape Data row labelled Gap Size. The tile shape is a basically a rectangle that can be changed to a half or double-width one by use of right mouse actions. The position of the connection point in the tile can be controlled by two Shape Data rows on each tile shape. The Horizontal Position can be changed between Left; Center; and Right, and the Vertical Position can be changed between Top; Middle; and Bottom.